The Beverly Hilton ballroom will be missing one very big star this evening—and now we know why. 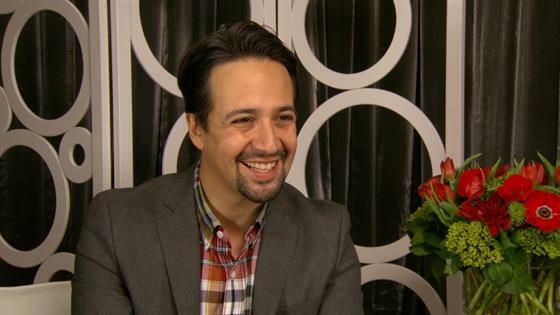 Despite the fact that he's nominated for Best Performance by an Actor in a Motion Picture—Musical or Comedy for his work in Mary Poppins Returns, Lin-Manuel Miranda sadly will not be in attendance at the 2019 Golden Globes and the Hamilton creator just explained his absence from Hollywood's biggest party in a video message that aired exclusively on E! 's Live From the Red Carpet pre-show. So, what was more important than the allure of an award? Turns out, something rather charitable. "I'm so thrilled to be nominated and honored to be nominated, but I'm in Puerto Rico," Miranda said in the video sent from the U.S. territory that was ravaged by Hurricane Maria back in 2017. "I'm playing Hamilton in a production we're opening here to raise as much money as we can for artists and artistic organizations still struggling to recover in the wake of Hurricane Maria. But Miranda's charitable endeavors aren't stopping there. As he announced exclusively on E!, he's starting a new contest for those who'd like to get a chance to see the Hamilton creator in action one last time. "We're going to raffle off 50 pairs of tickets to closing night. All of the money will go to the Flamboyan Arts Fund, which is raising money for artists in Puerto Rico," he said. To enter the contest, all you have to do is head over to prizeo.com/ham4pr50 for your chance to win. What are you waiting for? Go! "I hope you enter and I hope I get to see you closing night," Miranda continued, with one last message aimed at the hosts of tonight's big show. "Tell Sandra Oh and Andy Samberg I love them very much." Aside from Miranda's nomination, Mary Poppins Returns is also up for Best Motion Picture—Musical or Comedy, as well as Best Performance by an Actress in a Motion Picture—Musical or Comedy for star Emily Blunt.